The turn of the twentieth century ushered in controversial advances in psychiatry that attracted intellectuals with an ardent desire to heal patients through the power of psychotherapy. 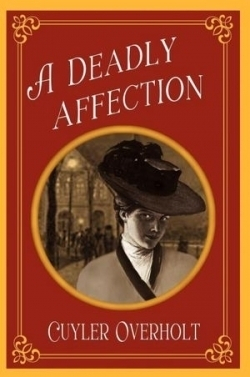 Set in New York in 1907, A Deadly Affection offers a realistic look at a turbulent period in U.S. history from the perspective of Genevieve Summerford, a gifted doctor with a troubled past, who must clear a patient charged with killing another physician. In this unfortunate scenario, all evidence points to Eliza Miner, the accused, which makes Summerford herself appear guilty, not only for attempting to prove the woman’s innocence, but also for actually causing the bloodthirsty crime. As the investigation progresses, what seems to be a cut-and-dried case turns into an intricate web of deception, shocking to anyone seeking a simple explanation for a deplorable, violent outburst. The book deserves high marks for outstanding editing and Overholt’s page-turning style, which entertains as well as educates. Backed by meticulous research and presented with acute attention to detail, a novel that could have slipped into the abyss of the ordinary shines like a star in a highly competitive genre. Like a Sherlock Holmes-inspired sleuth, the protagonist resorts to more than medical science to defend her patient, giving the story a commercial edge it would have lacked in a classic literary work with little action. Even a seasoned reader of murder mysteries will be surprised at the number of false conclusions one can reach when examining a crime as complicated as the one in Overholt’s debut novel. Buried secrets and long-ago mistakes emerge in this absorbing glimpse of the developmental days of psychiatry.